There is little question that Ewen Henderson (1934-2000) was continually re-writing the rules, or more precisely demonstrating that there are no rules at all. 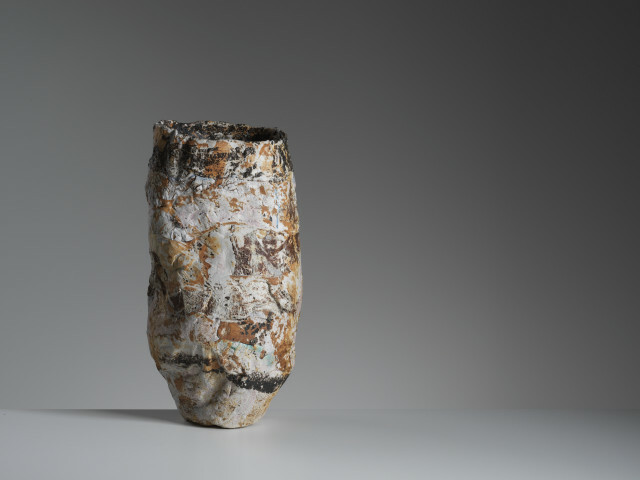 To Ewen ‘form’ was not static, but something in flux, from the energy of its initial making to the transmogrification (a word he liked) in the kiln. There was a sense of continual transition, part of a restless development of obsessions and ideas, ideas that showed that shape, surface and colour are fluid, forever shifting, like a Cubist abstract, a complex interaction of two and three-dimensional drawing. As the poet Christopher Reid wrote, for Ewen “ideas were tactile”, and they were never an end in themselves, but openings to new navigations. Work in clay, work on paper, there was no real distinction. His use of watercolour, of gouache and collage were simply an extension of what he did in ceramics, seeking the same depth, just as his pots and sculpture were as much about the painterly; collages and assemblages with delicate washes as well as thicker, bolder impastos. If anyone was searching for the mysteries of a fourth dimension, it was Ewen. A celestial conversation with Stephen Hawking, in what Ewen always called “the happier hunting ground", might well be going on as I write. For pushing, teasing out and stretching material, really playing with it to find new terrains of volume and space, was what Ewen was about. He was, like his work, a man of many layers. As a young critic prematurely set in my ways, I found the world he opened up (in every sense) exotic and revelatory. For Ewen clay was a substance that connected with much broader landscapes, both natural and urban, to art in many other media, both visual and aural. He was eloquent in making the links between the best of pottery (his terms of reference went back to the earliest pots, from across the Mediterranean to China and Japan) to ancient sculpture and painting (the megalithic stones, the cave paintings of Lascaux and Altamira). He loved early vessels for their quirks of shape, for their natural expressiveness. Examples of these were amongst the many things to see in his Camden Town sitting room, a first floor space which was also full of books and CDs. On the floor and shelves were ethnographic and tribal objects, as well as new pieces from the kiln to examine, though not always easy to see on an evening visit to this quietly lit room. Ewen could get agitated if you asked for more light, for I think seeing with the hands was good enough for him, a much neglected sense. He liked to leave art books open on the floor, sometimes propped up, so he could study from his seat images that intrigued him, and which would always be discussed. Ewen never stopped listening to music, and again Christopher Reid comes to mind when he called it his “ideal form of sculpture”.The earphones came off only reluctantly, even with visitors present. Stephen Spender vividly described the look of bliss on the poet David Jones’s face, his body swaying, as he listened intently to a record of Gregorian chants, and Ewen's bodily expressions were memorable in the same way when he played, say, some Ligeti or late Beethoven. He became animated by an interesting conversation, thoughts and words delineated by his eye, arm and hand gestures. Ewen’s impatience, sometimes anger with the world, as well as his great love of it, was part of his generosity, his need to share, part of the tension that drove him on. His honesty and forthrightness meant he could never be part of any establishment. He was too much an outsider for that. No doubt he would have endorsed the opinion of one of his heroes, Groucho Marx; “I don’t want to belong to any club that will accept me as a member”. The conversation continued in the garden, a magical room where clay forms met nature again, combining and mingling with the trees and plants. Henderson jars, dishes, bowls, monoliths and other structures were cracked and broken by frost, re-coloured by rain and lichen. There was something bone-like and regenerative about this place, everything springing into new life. Nature’s elaboration and re-absorption of human art, all part of a greater cyclic process. It was the same in his studio, at the foot of the garden, another debating chamber where the latest projects were talked about and re-examined. Here, along with new pieces were the fragments of old ones, shards that might suggest fresh ventures and journeys. Walls were covered in drawings and paintings, accretions of them, as if he was making one greater collage of his preoccupations. Why was Ewen Henderson, this “artist in fluxed earth” (as he called himself) such a significant, one-off figure in British culture? It was simply because he had no formulas, no methodology, no preferred ways of making. Every piece was a re-think, taking the structural and sensory nature of his medium into completely unknown regions. Ewen had such a hunger for life, for the way that art and its making could alter and deepen perception. He needed to be awkward, to provoke and question because he knew that questions were vital where answers were complacent, and Ewen feared complacency as much as he did convention. His work raised the bar, always youthful, so that it remains as ahead of its time now as when he died. This has been his gift to us.